If you are looking for an all natural and hand made beard balm with a firm consistency, stop right now, you have found it! Savage Alchemy who are a fairly new brand have sent me a beard balm, butter and an oil in three scents and I have previously reviewed the Obsidian beard balm, butter & oil. The base for the Savage Alchemy balms is made up using Shea Butter, Cocoa Butter, Beeswax, Hemp seed oil, Jojoba oil, Argan oil & Sweet Almond oil. As I said it has a firm consistency and I found that I needed to use a plectrum to scrape some out and then it takes very slightly longer to work until ready to work into my beard hair. Of course the result is that it gives a very nice hold, it kept my beard looking good and in shape and it also left it feeling softer. The Kyanite scent is a blend of Pink Grapefruit, May Chang and Lemongrass essential oils and I love it! The result is a very fresh burst of scent, you have no doubt that you are wearing a scented balm. It reminds me of Lemon Sherbet and that is down to the May Chang and then coming in after that you get a slight scent from the hemp used in the base. 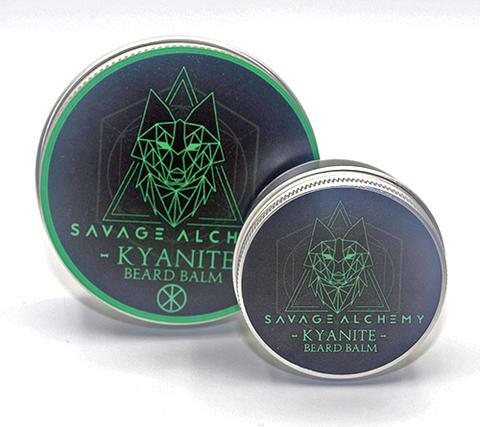 The Savage Alchemy Kyanite beard balm comes in a metal tin with a screw lid and is available in two sizes, 30g costs £8.99 and the 60g tin costs £14.99.